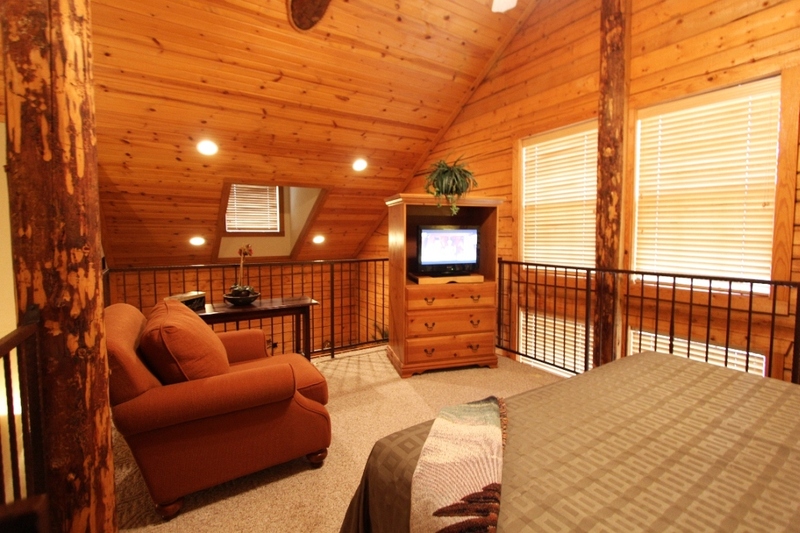 One of the most sought-after log cabins at Thousand Hills Hotel & Resort is the Two-Bedroom Branson Loft Log Cabin. Branson log cabins are spacious and perfect for a family as they offer luxurious and comfortable living that cannot be enjoyed in regular hotel rooms. These log cabins with loft features a living room with fireplace, plasma television, sleeper sofa, and a private deck with gas grill. The master bedroom downstairs features a private bath with a separate shower. The queen bedroom upstairs has private balcony and a queen bed in a loft bedroom. All of the log cabins at Thousand Hills Hotel & Resort have air conditioning, heating, ceiling fans, and table with 4 chairs. Thousand Hills Hotel & Resort offers luxury, comfort, and convenience to every guest, so each log cabin is individually designed so that no two cabins will come out exactly alike. The two-bedroom log cabin covers an area of 1450 square feet of space that can comfortably accommodate a family of 8. The log cabin has two baths, one downstairs and one upstairs. If extra sleeping space is needed, upstairs has a sleeping loft with a queen size bed. The living room has excellent amenities such as cable TV, DVD player, free high speed wireless internet access, a sofa sleeper, and a screened porch where you can view beautiful scenery and wildlife around the Ozarks Mountains. With the fully furnished kitchen of the Two Bedroom Branson Log Cabins with Loft, you can easily prepare meals for 8 guests. The kitchen is completely equipped with microwave, refrigerator, dishwasher, oven, small appliances, dishes, utensils, pots, pans, and more. Washer and dryer are also included in the log cabins that visitors will surely appreciate especially when they stay longer as they can wash and clean their dirty clothes and get back home without the worries of bringing home dirty personal belongings. While you take the Two-bedroom Branson loft log cabins your home away from home during your wonderful spring break in Branson, give some time to go out and see what Branson has to offer. Although the loft log cabins are located in the area near the wildlife and wooded valleys, it is actually located just a few blocks off of the Highway 76 Strip. If you want to enjoy entertaining family shows such as the Baldknobbers, the Presleys, The Track Family Fun Park, and Tanger Outlets for those who want to go shopping, the two-bedroom log cabin is the perfect place to stay in Branson. Memories of a wonderful spring vacations conjure up lazy walking in the woods, camping trips, and hiking through the wonders of natural beauty of the wildlife. Activities at the Thousand Hills Hotel & Resort are modeled for your family to uncover excellent attractions around the area. Whether you’re into action to enjoy outdoor activity or in the mood for relaxation, you’re sure to discover something exciting and entertaining while staying at the 2 Bedroom Loft Log Cabins at the Thousand Hills Hotel & Resort.